Back to Campaign 2018 index page. House Minority Leader Nancy Pelosi (D-Calif.) all but guaranteed Democratic victory in the House, as voters head to the polls today for what could be a landmark midterm election. Democrats were feeling confident in 2016, too, when President Trump won a victory practically no one predicted. But, Pelosi said at a news conference this morning, "this is different." "We are one district at a time," she said. "This is very discrete, and we're making a judgment about one district at a time. The popular vote rules." Indeed, the advance ballot numbers look good for Democrats, with some election watchers predicting midterm records when it's all over. More than 38 million people have voted early, compared with about 27 million in the 2014 midterms, according to numbers from Michael McDonald, an associate professor at the University of Florida who tracks turnout. Democratic Congressional Campaign Committee Chairman Ben Ray Luján (D-N.M.) said this morning the party has built its largest House battleground in over a decade, with investments in more than 80 races. That's helped push big early voting turnout increases among key Democratic demographic groups, including a 261 percent increase over 2014 among millennials and a 180 percent increase in Hispanic turnout, Luján said. "This morning has been encouraging," he added. "We're seeing long lines all across America, people waiting to vote. The rain is not scaring anyone away." Pelosi also made her final pre-election pitch for the issue Democrats have been campaigning on for months: health care. 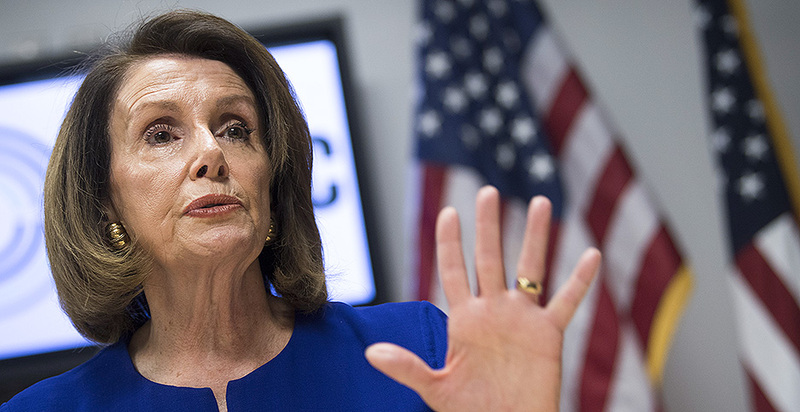 "This is the issue that is on the ballot," Pelosi said. "This election is about health care." But she suggested she would make campaign finance reform and "reducing the role of big dark money" a priority if Democrats take the House. Without the influence of big donors, she said, "we can pass environmental protections because we're not dominated by any industry in that regard." Democratic leaders have also talked up infrastructure as a priority, but broadly; Pelosi framed a Democratic House as a return to normalcy amid the turmoil of the Trump administration. "When we win on the opening day, our Democratic Congress will be open and transparent so people can see the impact of legislation on their lives and weigh in on the decisions," Pelosi said. "It will strive for bipartisanship." In the Senate, however, Democrats have a tougher road to the majority, and most observers expect Republicans to hang on. Either way, said Sen. Mazie Hirono (D-Hawaii), this election is about Trump. "I am very hopeful that we'll be able to take the Senate, and clearly, we are on track to take the House," she said on CNN yesterday. "But we have to go down to the wire. I take nothing for granted anywhere." Democrats are optimistic about the 36 governorships up for grabs across the country as well. In Florida, Democrat Andrew Gillum has nearly a 4-point lead over Republican Rep. Ron DeSantis in the RealClearPolitics polling average. And in Georgia, a traditionally Republican state, Democrat Stacey Abrams narrowly trails Georgia Secretary of State Brian Kemp in another race that's garnered national attention. On CNN, Washington Gov. Jay Inslee, chairman of the Democratic Governors Association, said he was channelling the singer James Brown. "This is an 'I Feel Good' moment," Inslee said. Democrat leaders, including former presidential nominee Hillary Clinton, took to Twitter this morning to push participation and turnout as the keys to victory, a message that was perhaps best summed up by former Secretary of State John Kerry. "Donald Trump didn't just win because of those that voted for him — he won because millions didn't cast a vote at all," Kerry wrote. "Vote, and you may have disappointment — but you'll never have regrets." Trump, too, has made his own frantic push on behalf of congressional Republicans, often keeping Pelosi and other Democratic leaders in the political crosshairs. 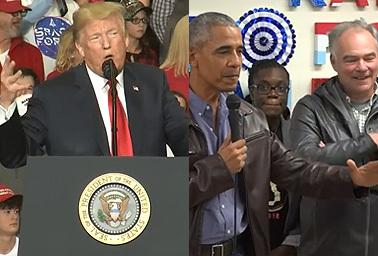 Trump has held 11 rallies in eight states on behalf of Republican candidates in recent weeks, including one last night during which he brought up Fox News personalities Sean Hannity and Jeanine Pirro. The president will spend today "making phone calls, monitoring Congressional, Senate and Gubernatorial races across the country and meeting with his political team for real-time updates," White House press secretary Sarah Huckabee Sanders said in a statement. Trump has also attempted to rally his base by promoting what critics call racist and anti-Semitic conspiracy theories about a caravan of migrants moving through southern Mexico. A Trump campaign ad referencing the caravan was even pulled from the major networks, with CNN calling it "racist." In a tweet last night, Trump tied the two tactics together in an effort to promote Republican Josh Hawley in his tight Senate race in Missouri against incumbent Democratic Sen. Claire McCaskill. "A vote for Claire McCaskill is a vote for [Democratic New York Sen. Chuck] Schumer, Pelosi, [Democratic California Rep. Maxine] Waters, and their socialist agenda," he wrote. "Claire voted IN FAVOR of deadly Sanctuary Cities — she would rather protect criminal aliens than American citizens, which is why she needs to be voted out of office." McCaskill, in fact, has voted both for and against measures to defund so-called sanctuary cities, according to Politifact. The president's allies are piling on. Former Utah Republican Rep. Jason Chaffetz said on Fox News this morning that Pelosi "will be the speaker of the House if the Democrats take control," despite Democrats "distancing" themselves from the California Democrat. Chaffetz added that a win for Democrats means a major shift in House committee leadership, noting that Democrats choose chairmen based on seniority. "You thought Halloween was scary? Maxine Waters as chairman of Financial Services, that scares a lot of people. I think it will scare the markets, as well," he said, referring to the longtime California Democrat who is currently ranking member of the Financial Services panel. Waters, for her part, said on MSNBC yesterday she would look to chair the panel if Democrats win the House. "I have the seniority. I have the relationships," she said. "I've spent a lot of time on Dodd-Frank reforms." Congressional Republican leaders, meanwhile, have had a decidedly different message down the home stretch, though they've often avoided stepping on Trump's toes. National Republican Congressional Committee Chairman Steve Stivers (R-Ohio) has homed in on the good job growth numbers over the past several months and the Republican tax cuts passed last year. "I think our voters are looking for opportunity — hope, growth and opportunity. That's what we've given them through our tax cuts and regulatory reform, and they want to keep America safe," Stivers said on Fox News this morning. "It's really those two things that our voters want and that all Americans want." Stivers has also spoken out against Iowa Republican Rep. Steve King, who is facing a surprisingly tight race. King's history of racist remarks has garnered a national spotlight in recent weeks, in part because of an interview he did over the summer with a far-right Austrian party, during which he lamented the effects of racial diversity and the decline of "Western civilization." King has gotten a boost, however, from Iowa Republican Sen. Chuck Grassley, who filmed a short endorsement, citing King's support for ethanol and wind. Rep. Chris Stewart (R-Utah) said yesterday on CNN that Republicans have not yet written off the House, predicting that "we may have some surprises tomorrow." Perhaps ironically, he took solace in the same idea as Pelosi: Each House race is different. "There are 435 House elections," Stewart said. "They're all individual, and they really pivot many times on local issues and the local candidates." Reporters Robin Bravender and Kellie Lunney contributed.